JAKARTA - Chinese President Xi Jinping's special envoy and Vice Premier Sun Chunlan on Sunday met with Puan Maharani, Indonesia's Coordinating Minister for Human Development and Culture. meets with Puan Maharani, Indonesia's Coordinating Minister for Human Development and Culture in Jakarta on Sunday. Sun, on behalf of the Chinese government and people, extended warm congratulations to the successful opening of the 18th Asian Games and expressed condolences over the strong earthquake occurred in the country's island of Lombok. This year is the fifth anniversary of the establishment of China-Indonesia comprehensive strategic partnership, she said, adding that with the guidance of the two countries' leaders, China-Indonesia relations have achieved rapid development by actively aligning their development strategies and fully promoting mutually-beneficial and practical cooperation. Citing the complicated and sensitive global political and economic situations, Sun said China and Indonesia actively take responsibilities as major countries and maintain communication and coordination on regional and global affairs to jointly promote peace, stability and development in regions as well as the world. Sun said people-to-people exchanges serve as the bond and bridge in enhancing the two peoples' friendship and mutual trust. China is willing to work with Indonesia to deepen cooperation in people-to-people exchanges to help the development of China-Indonesia comprehensive strategic partnership, she noted. The two countries should consolidate cooperation in education, especially in such fields as higher and professional education and training of skills, she suggested, adding that China and Indonesia should also push forward cultural exchanges and promote cooperation in sports. Sun said the two countries need to work together to expand cooperation in tourism industry to boost personnel exchanges and strengthen cooperation in tourism security to avoid serious accidents. She also called for closer communications among the two countries' youths, saying that China welcomes more young people from Indonesia to visit to and study in China. In addition, China and Indonesia should enhance cooperation in sanitation sector and promote cooperation in such areas as public health, overall health, training and health education. 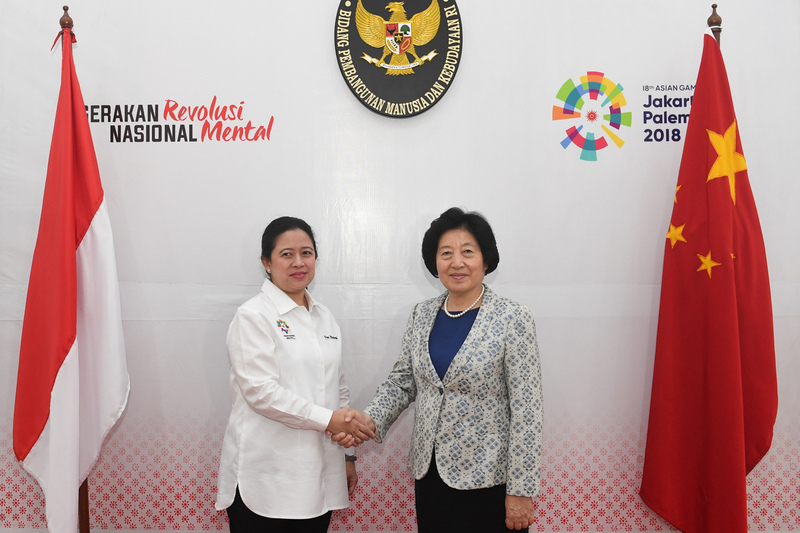 For her part, Puan Maharani welcomed Sun attended the opening ceremony of the Jakarta Asiad as President Xi's special envoy and thanked China's support and the importance it attached to the sport event. The Indonesian government and people thanked China's valuable assistance after the strong earthquake hit the Lombok Island, she said, adding that it showcased the friend relationship and profound friendship between the two peoples. The Indonesian side pays great attention to Sun's proposals on the two countries' people-to-people exchanges and looks forward to working with China to further push forward China-Indonesia cooperation in education, science and technology, culture, sanitation and sports, so as to promote the development of bilateral ties and bring tangible benefits to the two peoples, she said.